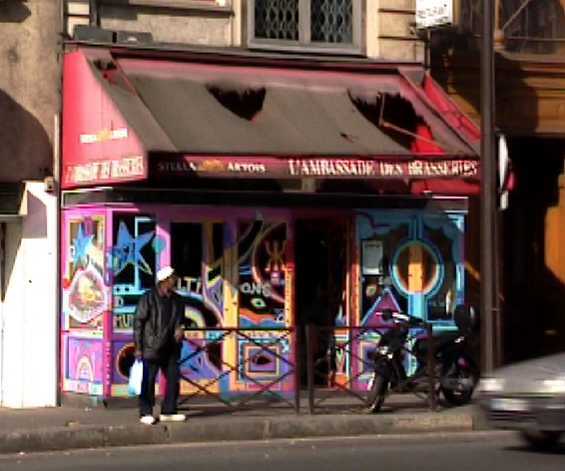 A tiny little place where the windows have all been painted with strange multi-colored runes and symbols, bizarre. People come and go and seem to know each other, each new visitor coming in to shake everybody's hand but mine. Pop dance music is playing. A window cleaner, dressed in a blue uniform, has come and started cleaning the insides of all the windows except for the ones me and my table are blocking. I don't know where he has gone just now but his crème fraîche bucket of cleaning implements is still sitting nearby on the floor. Right now there are no customers here at all. The door is propped open and it's a little cold though the sun is coming through the window behind me, warming my neck and back to a degree. Right now the song "Baby I Got Your Money" is playing, replete with expletives. The window cleaner guy came back; I think he's hoping I'll leave so he can clean the windows next to me, but for now he's started cleaning the outsides of the windows. A dirty black Clan Campbell scotch whisky ashtray sits on the table adjacent mine. The sugar here is granulated, in a black tube. The tables are cheap with fake wood tops; the black metal chairs have flesh-colored seat and back cushions. The bar counter and the rectangular column that stands in the middle of the room resemble black stone with smokey pink swirls like solar flares. Above the bar is the same design except black on red.